This page describes how to download/install a no-cost copy of NetAcquire MissionView Display (Base edition) software that never expires. MissionView Display (Base edition) provides a no-cost, powerful browser alternative for NetAcquire management from Windows, Linux, and macOS. 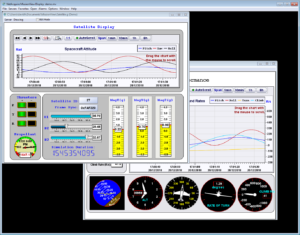 The download also includes a free 30-day evaluation of MissionView Display (Full edition) using online activation (the Full edition adds configurable data displays and data logging/replay). You can also receive a license key for a free 30-day evaluation of MissionView Designer by emailing us at licensing@netacquire.com. The MissionView Users Manual is included as part of the above software install, but it can also be downloaded in advance: MissionView Users Manual. MissionView consists of two software applications. MissionView Designer creates drawings consisting of various graphical elements. MissionView Display displays and connects drawings with NetAcquire server data sources and additionally manages multiple servers, offering access to configuration and status. The installation software consists of a wizard-based installation program: MissionViewSetup.exe on Windows, MissionViewSetup.sh on Linux, or MissionViewSetup.dmg on macOS. A standard user may run the installer without administrator/root privileges. MissionView Display and Designer may be installed independently. MissionView Display supports a no-cost Base edition. In addition, you can install a 30-day evaluation version both MissionView Display (Full edition) and MissionView Designer as follows. 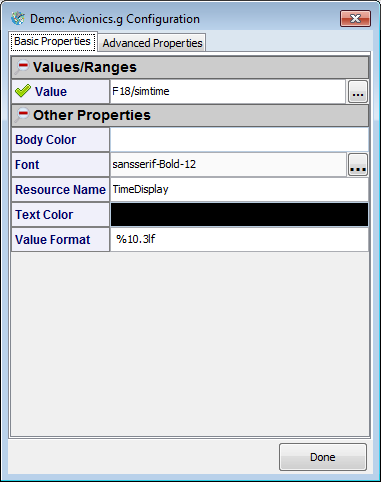 The evaluation version of MissionView Display (Full edition) does not require a product key. The installer automatically starts the trial if an Internet connection is available. Otherwise, the trial may be started either with or without Internet from within MissionView Display (click the Help menu then Licensing). The software is limited to MissionView Display Base edition functionality if the trial fails to start (e.g. no Internet and no offline trial request) or if the trial period expires. The evaluation version of MissionView Designer requires an evaluation key but does not require Internet activation. The evaluation key has a fixed expiry date. Please e-mail licensing@netacquire.com to obtain an evaluation key. A detailed description of the installation process as well as troubleshooting procedures is described in the MissionView Users Manual. 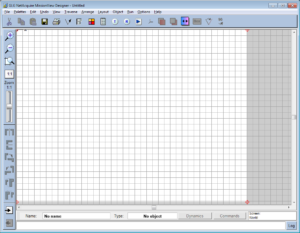 The following sections provide a quick walk-though of some basic usage of MissionView Display and MissionView Designer, starting with opening an existing demonstration drawing and then showing the creation of a simple drawing in Designer and loading that drawing in MissionView Display. Start MissionView Display. 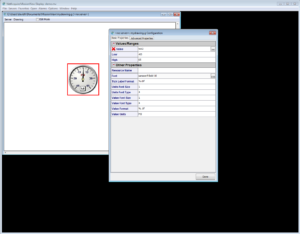 If you have previously used MissionView Display, the application will open to your last layout. During installation, if the “Open demo drawings” option was selected, demo drawings will automatically appear in your current layout. The real-time chart in each drawing has interactive features that can be accessed via mouse clicks for scrolling, zooming, etc. 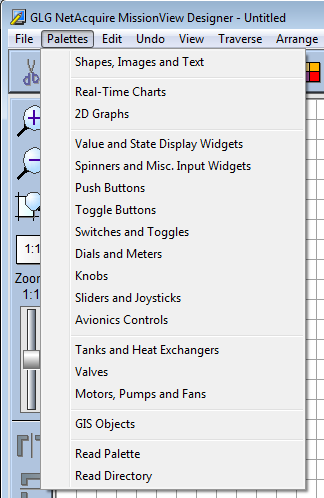 Right click any graphical objects in a drawing to explore and configure display properties. 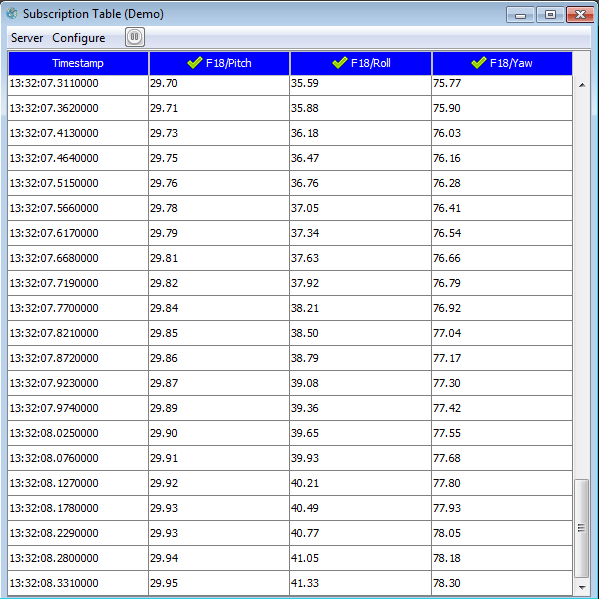 To open a subscription table display, click the Open menu and click Subscription Table. In the resulting Subscription Table window click the Server menu then click Connect…, then select the Demo hostname. 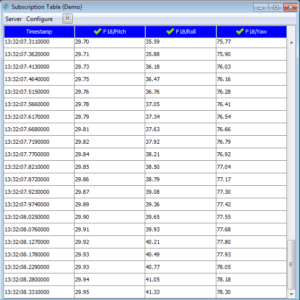 Click the Configure Subscriptions… button in the middle of the Subscription Table window and select subscription names to display. The F18 and Satellite groups can be expanded by clicking on the “+” sign to see more subscriptions. Click the OK button to view subscriptions. To open the logger user interface, click the Open menu and click Subscription Logger/Replayer. In the resulting Subscription Logger/Replayer window click the Server menu then click Connect…, then select the Demo hostname. Click the Configure menu and then click Subscriptions… and select subscription names to log. Selecting the F18 or Satellite domains will select all subscription in that domain for logging. Click the record (button with red circle) to start recording. To add a NetAcquire server, click the Servers menu and click Add… Type in a NetAcquire server hostname or IP address, and click OK. The Servers Management window will open and show the status of the connection. Click the Servers menu and find the server added above. This new menu entry contains the menu items for connecting a drawing or opening configuration/status pages on the server. 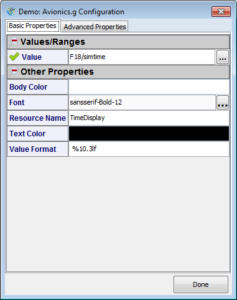 Click on System Management then Time Change & Source and the configuration page will open in a window. Using the mouse, move this window so both it and other windows can be seen at the same time. Click the File menu, then click Save Layout As…, then choose a name for this layout. Saving the layout creates a layout file (.mv). You can create different layouts to serve various purposes and include specific windows. 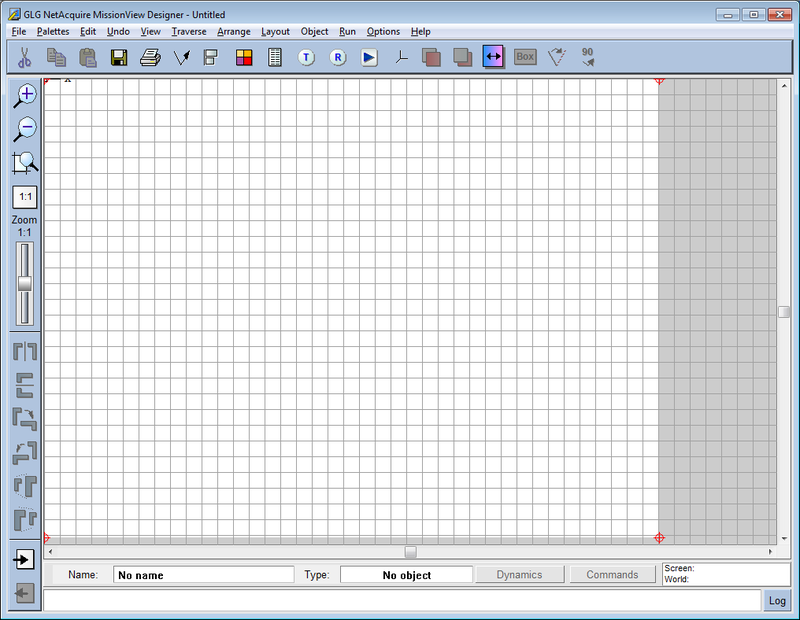 Start MissionView Designer. Designer opens with a blank, untitled drawing. Click on a Dial in the palette window such as the one at the far right of the top row, then click on the drawing area to place the dial into the drawing. 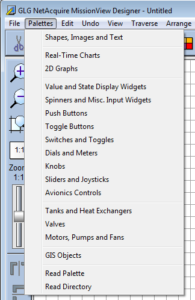 If not already selected, click on the dial in the drawing area to select it and then click on the Object Properties button, in the top toolbar. Change the property for High to be 65 and Low to be -65, then Click OK.
Click the File menu, then click Save and save the drawing to a convenient location using the name “mydrawing.g” (make sure to include the .g suffix). These steps complete the creation of a simple drawing with a single dial. Click the Servers menu, then click Demo, and finally Drawing…, then navigate to the drawing created in the Designer section above (mydrawing.g). Click Open to open the drawing with a connection to the “Demo” server. Once the drawing has opened you will see a window with a dial. Right-click the dial to bring up the dial’s configuration. Click on the Ellipses (…) button for the property “Value” to open the Publication selection dialog. Select “Sine m60” and click Link Publication. The dial will immediately begin displaying the value from the Demo server’s publication (sine wave moving from -60 to 60). Close the dialog when finished or you may make additional changes that get reflected immediately in the dial.